What: The Steel travel to Arizona to face the Rattlers in the first round for the second time. When: Saturday, August 6 at 7 p.m. (PT). Regular Season: April 1 - Rattlers 80, Steel 28; April 30 - Rattlers 68, Steel 21; June 11 - Rattlers 76, Steel 49. Steel History vs. Rattlers: 0-9 regular season; 0-1 playoffs. Note: The Steel were 15 seconds and an underthrown pass away from beating the Rattlers in the first round in 2014. The Steel finished the regular season 3-13 overall, 0-9 on the road and 1-7 against conference opponents. The are coming off a 48-46 home win over the Los Angeles KISS on August 1. They are averaging 41.9 points per game and are allowing 58.2 points per game. The Steel finished the season in fourth place in the National Conference. The Rattlers finished the regular season 13-3 overall, 8-0 at home and 8-0 against conference opponents. They are coming off a 68-20 home win over the Cleveland Gladiators on July 24. They are averaging 66.8 points per game and are allowing 47.9. The Rattlers finished the season in first place in the National Conference. First Downs per game - Steel 18.4; Rattlers 20.8. Yards per Game - Steel 252.1; Rattlers 289.4. 3rd Down Conversion - Steel 43%; Rattlers 57%. 4th Down Conversion - Steel 40%; Rattlers 56%. Total Tackles - Steel 404.5; Rattlers 453. 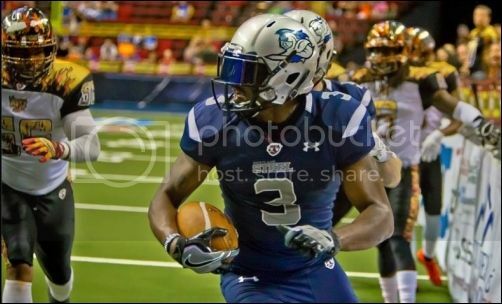 Tackles for Loss - Steel 24; Rattlers 36. Total Sacks - Steel 15; Rattlers 29. Fum Rec - Steel 9; Rattlers 16. 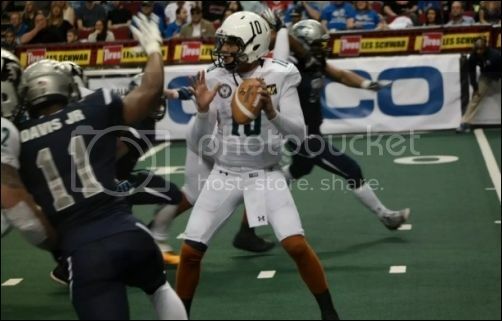 Interceptions - Steel 10; Rattlers 19. Had Intercepted - Steel 30; Rattlers11. Portland has won two of the last three and, if not for a blocked kick in the second-to-last-game at Tampa Bay, the Steel could be coming into the playoffs on a three-game winning streak. As it is, the Steel have won two of their last three. Shane Austin has been the leader at the QB position for which the franchise has seeked since it inception. He is a dual threat QB who can find the needle in the haystack, or turn nothing into something out of the pocket. He will need to play the best game of his AFL career in order to bring the Steel a win. Tom Gilson set the franchise mark for for receiving yards with 1,303. Sergio Gilliam intercepted two passes last week against the KISS Payer to Watch: Shaine Boyle (DB/KR). Wild Card: Rashaad Carter (WR). Arizona is trying to win its fourth ArenaBowl in five seasons. Forget for a moment that several of the Rattlers players are being paid under the table; this is a veteran team with players who have played together for several years. Nick Davila is among the best and will surely be headed to the AFL Hall of Fame. Rod Windsor is among the best, if not the best, at wide receiver. Davila has a knack of making average receivers look great. Windsor has 1,667 receiving yards, while Maurice Purify has 1,017. Arkeith Brown is among the league's better defenders and has 49.5 tackles and 6 interceptions on the season. The Steel's offensive line will have to contain Dimetrouos Tyson, who has 6 sacks. Player to Watch: Rod Windsor (WR). Wild Card: Dimetrious Tyson DB). The 2016 AFL playoff match ups are set. All eight teams will make the playoffs, which will culminate in ArenaBowl XXiX, to be hosted by the team with the better record between the participants (Rattlers, whose home arena is in Phoenix, will host the game in Glendale should they get that opportunity). The game will be held Friday, August 26 at 5 p.m.
** Game will be held at PPL Center; Allentown, Pennsylvania. The Steel's defense forced just 19 turnovers on the season; 10 interceptions and 9 fumbles. They forced two turnovers in last week's season finale win over the KISS. The following is a chronicle of the team's forced turnovers (by the defense) over the course of the season. Anatomy of a scoring drive: The video below, taken by SCtoC's Nevadanut , shows the Portland Steel's scoring drive in the third quarter against the Los Angeles KISS. From Kickoff to Extra Point, it spans the whole spectrum of the seven-play drive, which began at 5:53 and culminated with Ernesto Lacayo's point after touchdown at the 2:29 mark of the quarter. The score tied the game at 27-27. The Steel would go on to win the game, 48-46. The play-by-play of the drive appears below the video. Donny Hageman kickoff 55 yards to the PDX-5. Shaine Boyle Shaine return 14 yards to the PDX9 (Justin Wilson tackle). Pdx	1-10	at Pdx09 - Steel drive starts at 05:53. Pdx	1-10	at Pdx09 - Shane Austin pass complete to Rashaad Carter for 7 yards (Josh Victorian tackle). Pdx	2-3	at Pdx16 - Shane Austin pass complete to Jabin Sambano for 8 yards (Qumain Black tackle). Pdx	1-10	at Pdx24 - Shane Austin Shane pass complete to Tom Gilson for 15 yards ()Josh Victorian tackle). Pdx	1-10	at Lak11 - PENALTY KISS - Illegal Formation 6 yards to the LAK5. Pdx	1-G	at Lak05 - Bryson Kelly rush for 4 yards (Dontay Moch tackle). Pdx	2-G	at Lak01 - Kevin Myers rush for 1 yard. TOUCHDOWN, clock 02:29. 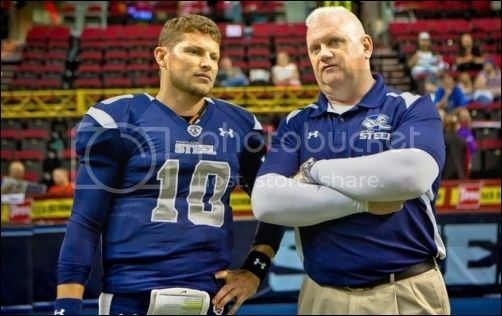 Steel QB Shane Austin and HC/GM Ron James will look to give fans their first Portland AFL playoff win. CBS Sport Network is staying with the Orlando-Jacksonville game. It's tied at 61-61 in overtime. An upset would be huge. Let's go Steel! Apparently the AFL is not updating the scoring. I will try to keep as best I can. Touchdown Rattlers. Rod Windsor 4 yard pass from Nick Davila. Nick Pertuit kick. Turesdell is back for the Steel. Touchdown Ratters. Anthony Amos 45 yard pass from Nick Davila. Touchdown Steel. Kevin Meyers 1 yard run. Ernesto Lacayo kick. Touchdown Rattlers. Anthony Amos 28 yard pass from Nick Davila. Nick Pertuit kick. Touchdown Steel. Jared Perry 12 yard pass from Shane Austin. Ernesto Lacayo kick. Touchdown Rattlers. Maurice Purify 12 yard pass from Nick Davila. Nick Pertuit kick. Touchdown Rattlers. Rod Windsor 2 yard pass from Nick Davila. Nick Pertuit kick.